Professor Robert Lue (pictured), the HarvardX faculty director, presented the latest thinking on HarvardX and its global presence during a meeting in Hong Kong on Monday. This was the first event in a weeklong visit to Asia with President Drew Faust. HONG KONG — On the first day of a weeklong visit to Asia, Harvard President Drew Faust on Monday called knowledge “the most important currency of the 21st century,” highlighting faculty research, student engagement, and online learning as central to Harvard’s global strategy. Faust met with alumni and business leaders in Hong Kong to discuss Harvard’s online learning initiative, HarvardX, and the edX platform developed in partnership with the Massachusetts Institute of Technology. “This is a moment of transformation for education, and we want to be able to lead in a way that allows us to enhance our outreach to the world, even as it helps us understand new ways to teach our students on campus,” said Faust. Of more than 700,000 enrollments through edX, about 60 percent come from outside the United States. Professor Robert Lue, the HarvardX faculty director, presented the latest thinking on HarvardX and its global presence. He told 30 attendees that 102 Harvard faculty members had demonstrated an interest in developing programs as part of HarvardX, noting that the initiative would allow Harvard to expand its reach and impact globally. Lue said the flexibility of online learning and the edX platform would create opportunities to go beyond MOOCs (Massive Open Online Courses) and develop smaller modules that would encourage collaboration and target particular audiences. “Already, public health faculty who developed the first HarvardX courses are discussing taking one of the modules and tailoring it specifically to bring it to families in Boston, with the possibility of a focus on one key issue, such as childhood obesity,” said Lue. “That was not in the original plan for the course, but we see tremendous potential in the ability to adapt content from its original form. “This is an example of the content bringing people together rather than keeping them apart,” he said. The discussion was moderated by Victor Fung, group chairman of the Li & Fung Group, who has a doctorate in business economics from Harvard and was a professor at Harvard Business School (HBS) in the early 1970s. During her first visit to Hong Kong, President Drew Faust hosted a lunch for leaders from six local institutions of higher education. Faust (left) spoke with Tony F. Chan, president of Hong Kong University of Science and Technology, about the trends in education. Fung said that bringing together online education and traditional, place-based education — whether on campus or in communities — could herald new opportunities and engagement throughout the world. “When you can use the Web to form communities of interest at the local level that can enhance experiences on the Web, you begin to realize that the ‘bricks and clicks’ potential is tremendous,” said Fung. 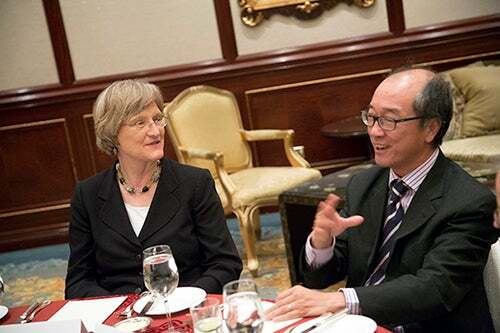 During her first visit to Hong Kong, Faust also hosted a lunch for leaders from six local institutions of higher education, who discussed trends in education. The local leaders told Faust that the continued evolution of Hong Kong’s economy from manufacturing-based to knowledge-based was creating a need for new thinking in higher education, including curriculum reform shifting from three-year to four-year undergraduate degrees, along with a greater emphasis on international issues, service-oriented learning, and the liberal arts. Faust also visited the Harvard Business School’s Asia-Pacific Research Center, the first overseas HBS research center, located in Hong Kong’s Central neighborhood. The center has contributed to more than 150 research projects and 175 cases since it was founded in 1999, and it encourages engagement with local experts and institutions to support faculty research. Michael Shih-Ta Chen, the center’s executive director, said HBS Dean Nitin Nohria’s emphasis on internationalization had brought even greater focus on Asia, with 370 students coming to the continent as part of the new FIELD global immersion initiative introduced by Nohria to expand students’ exposure to global business. President Drew Faust’s visit to Asia continues throughout the week, including meetings with local alumni groups, and travel to South Korea. Educational institutions “should not become armed bastions, with more guns in schools. Teachers need to teach,” said Marian Wright Edelman, founder and president of the Children's Defense Fund, told her Askwith Forum audience.